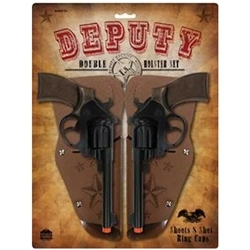 The Deputy Double Gun and Holster Set includes two holsters and two pistols. The holsters will fit on any belt. The holsters are made of black vinyl with a star print and the guns feature a black finish with brown handles. Guns fire the 8 shot ring caps. The deputy double gun and holster set adds the perfect finishing touch to a number of different costumes including wild west sheriffs, sheriff deputies, and cowboys.